This is without a doubt the most prepared I've ever been for Oscar night. I've seen all 10 Best Picture nominees and in the major acting and directing categories, I've only missed four individual performances. Unfortunately it seems as if most of the awards have already been decided and that leaves little suspense in place on Sunday night. Maybe we'll see some upsets but I'm pretty sure things will go according to plan. I actually think I'll be happy with most of the results (especially in the acting categories). As usual I will be giving you the nominees in the major categories along with whom (or what) I think will take home the Oscar (highlighted in green) as well as the choice I would make if I was a member of the Academy (I really should be one) and had a vote (highlighted in blue). Hopefully you all got a chance to see a good share of the Best Picture nominees. I really do think most of them are deserving. I will list the Best Picture noms at the end of this post in order of how I would rank them (from worst to best). Franco and Eisenberg get the shaft as their awesome performances came during the year of Firth. Lawrence was really good in a terrible Winter's Bone film. She or Annette may have won if it wasn't for Portman's career-best performance. Again, Geoffrey Rush picked the wrong year to go up against Bale. He's 1B to Christian's flawless 1A. This will be the closest race on Oscar night. Leo was amazing in The Fighter and nearly as effective as Christian Bale. I think she narrowly beats out Steinfeld who should have been nominated for lead actress in True Grit. Steinfeld came out of nowhere and totally owns that movie, trumping even a great performance by Jeff Bridges. Well I really wanted Christopher Nolan to win this award, but he got the shaft so I guess the Cohen Brothers would be my next choice. It's a toss-up between Fincher and Hooper though. Fincher will probably win although he deserved it more for Benjamin Button. Another stone cold lock for Sorkin, but I thought the story crafting of 127 Hours was superior. I really hope that Inception takes the prize here. Chris Nolan deserves some recognition and I think the voters may reward him for getting the shaft in the directing category. 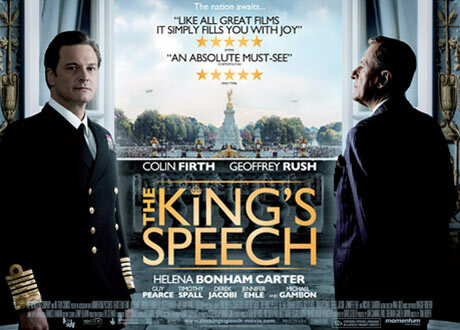 If The King's Speech has a run on the other awards, Seidler may follow suit and take this one. Hopefully the more deserving film (King's Speech) beats out Social Network. I would love to see Inception win but there's no chance in hell that will happen. Should be an interesting night with James Franco and Anne Hathaway hosting. Now I just need to get out to the theater for the first time in 2011. It should happen soon as Battle: Los Angeles opens up next weekend.